William KNOWLES was born in Darley, son of George and Sarah. William became Head Gardener at the Winter Gardens in Smedley's Hydro in Matlock. 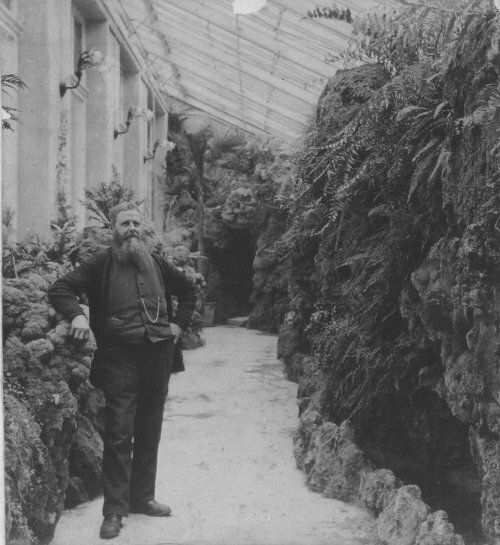 The Winter Gardens was like a very large greenhouse, and can be seen on the left of the main building in these two photos: X151, X182 William posed for a stereo photo, from which this photo is taken. The Winter Gardens were built by the author's GGFather William DOXEY, see: X114. William KNOWLES can be traced in the Census at these following links: 1891, 1881, 1861, 1851 The photo was sent by Brian Temple, who collects old stereoscopic photographs. He bought this one at a local antiques fair, he says it seems to be home made. William looks about 50, dating the photo to 1887.